Peatross Rob Lawing's rule, if it costs 7 mana, it better win you the game. This can't even kill an Erhnam Djinn, and most likely couldn't even kill a Wild Mongrel. Compare this to Wildfire, or Obliterate, or other stupidly expensive stuff, compare what it does, and then don't play it. Cantrips matter early on, later they are just nice. 1 in Constructed, 1.5 in Limited. Let's see ... is it really worth making a card a cantrip if it costs you 4-5 mana to make it a cantrip? Not in constructed, that's for sure. Play Volcanic Hammer, Shock, and Fiery Temper, but _never_ play this in constructed. I don't care if it's Judgment only constructed... you still shouldn't touch this. In limited, however, this card does have a slight bit of hope going for it. I'd only want to have to play one of these, but removal is removal. Still, this is pretty crappy. Hmmm.... nice thought, but Wizards truly missed the target on this one no doubt about it. Cantrip burn would be the best thing since sliced bread if its casting cost was bearable. Unfortunately, no burn spell that cantrips (and I don't count Browbeat) has ever been truly worth playing. Zap was a 3cc for 1 damage and one card. Okay for limited, but definitly not in constructed. Wizards decided to try again with Ember Shot, a 7cc for 3 damage and a card. Basically, this card is 4 more mana for 2 more damage when compared to Zap. First of all, red needs nothing like this. It's sitting fine with Fiery Temper, Volcanic Hammer, Violent Eruption, Firebolt, and Shock for burn. This card gets the last place in line, even behind Zap! In constructed 0, because Burn + Cantrip = Fun - 7cc = Crap on a Stick. This card deserves no better a rating, and no breaks. It is quite possibly the worst card for the constructed format in Judgment. Perhaps if it cost 3R or 4R for the same effect. As it stands, though, your opponent should be dead by turn 7 with any mono red or Green/Red Beats deck. In limited, it's not a high pick. It is, however, a playable card. This card will be your 21, 22, or 23 card in your deck. It will help, but not enough to make a major difference. In limited, a 2. Watson No review submitted yet. Peatross For some reason, I can't ever bring myself to play this card. I keep thinking it does good things, but honestly - it doesn't do them FAST enough. I've died many a time thinking that I wish I had more than 5 mana on the table. I can see this working in a certain style of deck, but I don't know that I want to pay that style. I prefer the quick beats. There are better finishers in the environment than this - and a whole hell of a lot of ways to do 3 damage. The 7cc is just too restrictive for even a control deck... slapping "draw a card" onto it doesn't make it any better. In case you had hope for Red after Breaking Point along comes another card to continue WOTC's screw red campaign (Cut it out Randy !). This 7 mana instant (is it really an instant if it costs 7 ?) which gives you an effect that used to cost R or 1R plus lets you draw a card (an effect that adds only 1 or 2 mana to the cost of spells in most other colors) makes this card simply the most grossly overcosted instant of Magic history. Andrew Chapman Who thought of this card?! A cantrip effect used to add 2 colorless mana to a pre-existing spell. Lightning Blast costs 4 and does 4 mana. So this costs 3 mana more and only does 3, just to draw a card? On top of that, when's the last time you saw Lightning Blast see much play? In Limited, it does have a couple things going for it. It can take out a creature, take out your opponent, its easily splashable, and it draws you a card. Even considering all that, I'd be hard pressed to play this card. Red wants to play very quickly, but Ember Shot makes you play very slowly even to have the mana to afford it. Even if you do get to 7 mana, the effect of 3 damage and a draw is far overcosted. For that, I'd expect to pay about 1RR or 3R. 6R is for game winners only. In constructed play, you're unlikely to have the resources to play Ember Shot. 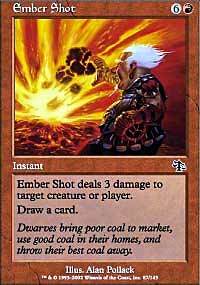 However, that extra card will frequently be crucial, and the 2 for 1 nature of Ember Shot is a factor worth considering. The card is about as good in limited, as it's more likely to be affordable, but the cantrip is less vital.